Canadian Mental Health Association calls for new legislation to bring mental health into balance with physical health. EDMONTON (ALBERTA) September 17, 2018 – Over half of Canadians (53%) consider anxiety and depression to be ‘epidemic’ in Canada, with that perception spiking amongst younger people, according to a new survey commissioned by the Canadian Mental Health Association (CMHA). Fifty-nine per cent of 18 to 34-year-olds consider anxiety and depression to be ‘epidemic’ in Canada, followed closely by addiction (56%) and ahead of physical illnesses such as cancer (50%), heart disease and stroke (34%), diabetes (31%) and HIV/AIDS (13%). 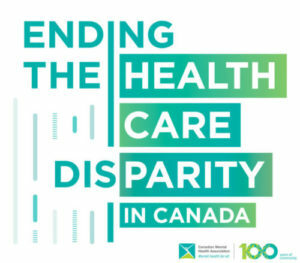 The survey accompanies a national CMHA policy paper, Mental Health in the Balance: Ending the Health Care Disparity in Canada, released today, which calls for new legislation to address unmet mental health needs and bring mental health care into balance with physical health care. Eighty-five per cent of Canadians say mental health services are among the most underfunded services in our health-care system — and the majority (86%) agree that the Government of Canada should fund mental health at the same level as physical health. “The Mental Health Parity Act we are advocating for is not just about increasing funding for mental health services, but also improving coordination, treatment, research and access and making better choices about how best to spend health-care dollars effectively,” says Dr. Smith. To make sure that those who need services and supports get them, new legislation must also address stigma and discrimination—in the health-care system, amongst practitioners and at the individual level—and improve access for those who are marginalized. Investments in social spending would address the root causes of mental illness: poverty, trauma and marginalization. In return, we boost our most vulnerable citizens’ ability to contribute to their communities and lessen the burden of illness nationally. The Canadian Mental Health Association, Alberta is made up of eight Regions, the Centre for Suicide Prevention (located in Calgary), and the Division (Provincial) office (located in Edmonton). CMHA Regional offices focus on the delivery of mental health recovery services, housing, advocacy and mental health promotion. CMHA’s Divisional office supports and promotes the work of CMHA across the province of Alberta for collective impact. The Division and Regions work cooperatively to advance the vision of mentally healthy people in a healthy society.